← Your Data Gets Lost Or Stolen Online Frequently. Do You Even Care? Search query data for “Facebook” and “MySpace” obtained from Google Trends overlaid on top of each other. ﻿﻿Facebook is like an infectious disease, experiencing a spike before its decline, according to US researchers who claim the social network will lose 80 percent of users by 2017. Two doctoral candidates in mechanical and aerospace engineering at Princeton University made their astonishing claims in a paper published online at a scientific research archive, but not yet peer-reviewed. 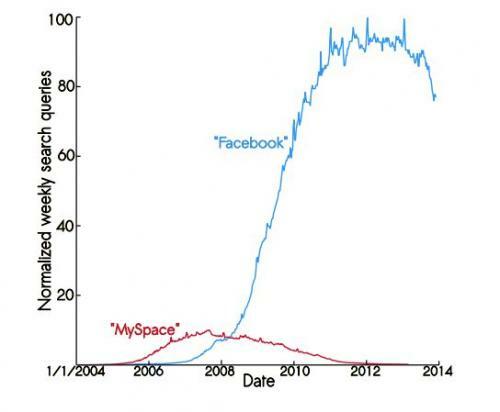 Based on the rise and fall of MySpace, John Cannarella and Joshua Spechler say that Facebook, the largest online social network in history, is set for a massive fall. “Ideas, like diseases, have been shown to spread infectiously between people before eventually dying out, and have been successfully described with epidemiological models,” they wrote. They applied a modiﬁed epidemiological model to describe the dynamics of user activity of online social networks, using Google data that is publicly available. It will make uncomfortable reading for the social media giant co-founded by Mark Zuckerberg, which has more than 1.1 billion users around the globe and turns 10 years old next month. Their study said Facebook, whose shares climbed to a new high of $58.51 this week, has been in decline in terms of data usage since 2012. “Facebook is expected to undergo rapid decline in the upcoming years, shrinking to 20 percent of its maximum size by December 2014,” said the report posted online to peers at ArXiv.org. The new research comes amid surveys suggesting that younger users started gravitating away from Facebook in 2013. Cannarella and Spechler told AFP they did not wish to comment publicly in person until their manuscript had completed its peer review process ahead of formal publication. But at least for now, Facebook’s fortunes are in good health. This entry was posted in Social Media, Technology and tagged Social Media, Technology. Bookmark the permalink.